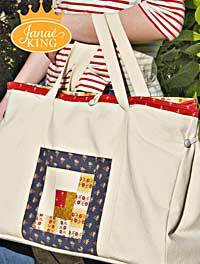 The Supersized Satchel Pattern by Janae King is a big bag that can be used as a sewing machine tote, large diaper bag, overnight bag, etc.! There are two large pockets on the outside of the tote, a button and loop fastener, and double handles. Finished size is 23" x 15" x 7". Shell of tote - 1 yard of 60" Duck Cloth or canvas from a painter's drop cloth or 1 and 1/2 yards of 42" wide fabric.